With summer on the verge of rearing its head, it’s time to dig into a winter album. 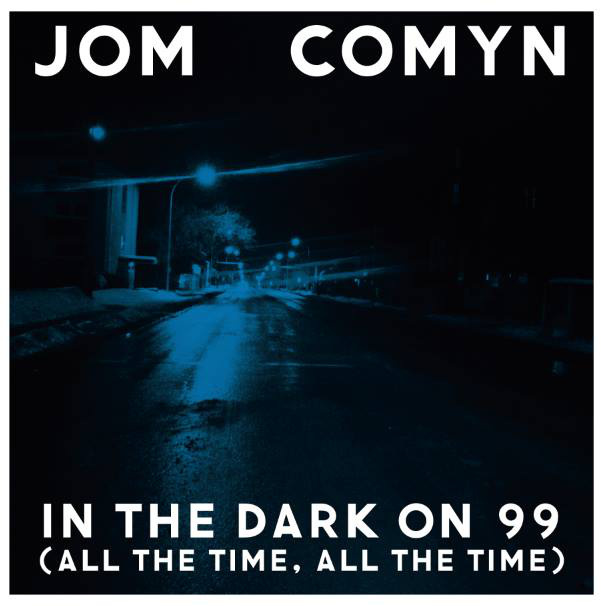 Somehow, Jom Comyn (aka Jim Cuming) has managed to turn an album full of guitar-based songs into one of the most compelling things you’ll hear for a while. Jom Comyn’s attack is twofold—simple but powerful arrangements, often nothing more than Cumin’s guitars, bass and drums, in combination with Cumin’s rich, deep vocals, which brings to mind the likes of Taylor Kirk of Timber Timbre or even Mark Andrade of Paradise Animals. To become instantly bewitched with In the Dark on 99 (All the Time, All the Time), listen to “Wish Upon a Storm” and try to argue that it’s not a gorgeously arranged song. It begins with some strings, barely heard outside of this song, before breaking into a very simple strummed-guitar melody. Cuming’s vocals are like gentle waves as they wash over the instruments. For something a little moodier, opener “In the Dark” does the trick, with ominous guitar chords and vocals to start off, before bringing in crashing drums and the screeching of what appears to be strings. It’s a perfect song to play at night while driving down Edmonton streets. For something a little warmer, look to “Cool Room” or the pretty closer “Waves, No Water” which includes guest vocals from Edmonton mainstay Jessica Jalbert. Jom Comyn is already well-known in Edmonton, and it’s high time that the rest of Canada took notice.